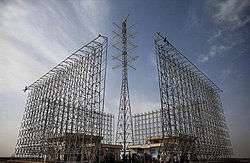 Sepehr (Persian: سپهر‎‎, meaning "sky") is an over-the-horizon radar (OTH) being developed by Iran. Little is known of the project, except it has a reported range of 3,000 km. It was scheduled to enter operational status in 2013. In August 2013, Iran announced completion of a first stage of the project with a range of only 300–700 km. In 2014 Iran announced it wished to establish a space-based radar system. It is currently expected to be finalised by the end of 2014. ↑ Iran Builds Space Radars, Uses New Passive Phased Array Radars. ↑ Fars News Agency, Iran to Establish Space-Based Radar System, Global Research, February 16, 2014. ↑ Iran Army Meluncurkan Strategic Space & Satellite Detecting Sepehr Radars.